See how many of the series titles you can figure out, everything will be revealed on 11/15. 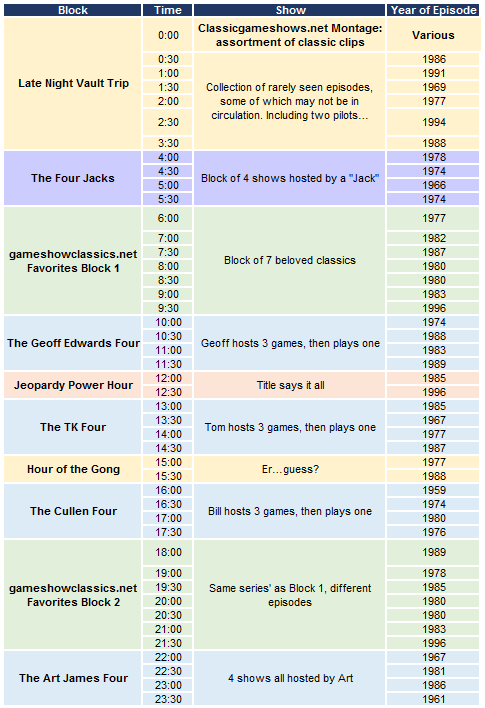 In the Cullen Four, for 1980, I'd go with Chain Reaction, Password Plus or Blockbusters in the 1980 slot, the '74 slot would go to the only existing episode of Winning Streak, the '76 slot would go to the unsold pilot titled Shoot the Works that catnap1972 uploaded before. 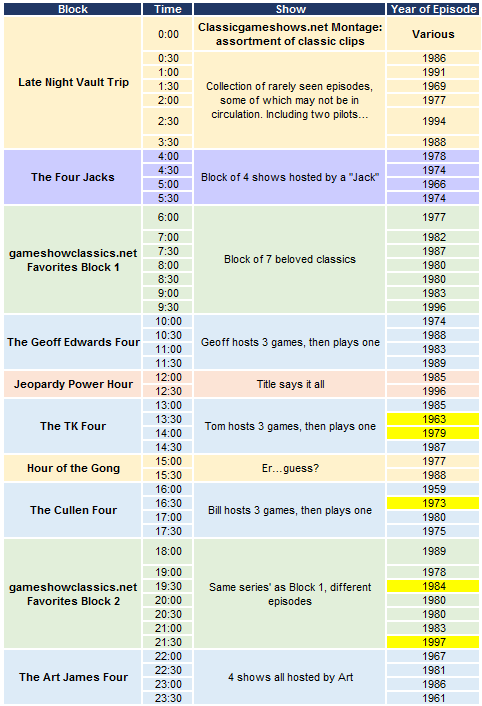 In the TK Four column, the 1985 slot would go to Body Language or the nighttime Price Is Right(hopefully the former is from an episode that wasn't rerun since 2001). The 1987 slot goes to where he played his only week of Super Password episodes. That's all I can think of currently. The 1989 slot in The Geoff Edwards Four would have to go to the Jackpot! reboot; 1988 would be either Chain Reaction or The Big Spin, and of course Starcade for 1983. Tom Kennedy hosted You Don't Say! in 1967, so that fills that column. The 1987 slot goes to where [Tom Kennedy] played his only week of Super Password episodes. That's all I can think of currently. Crosswits had a game show hosts week where he appeared. "Geoff hosts three games and plays one" - I think that this could be the "preview" episode of Talk About with him, Marc Summers, Steve Skrovan, and Scott Nemes. Also, if the 1989 was a hosting spot this could also be an episode of The Big Spin. I'm thinking the '61 show for Art might be Say When. As for Cullen, '59 has to be TPIR, '74 could be Winning Streak or The $25,000 Pyramid,, '80 could be Chain Reaction, BB or PP. The '76 show might be TTTT where he was a panelist. As for Cullen, '59 has to be TPIR, '74 could be Winning Streak or The $25,000 Pyramid,, '80 could be Chain Reaction, BB or PP. The '76 show might be TTTT where he was a panelist. '74 could also be one of the episodes of Fred Abrams' run of terror on Three on a Match. '76 could be the first episode of IGAS '76. Or a Pyramid. Or one of the appearances he made during one of his trips to LA. A '76 TTTT would be interesting given how few episodes from that period circulate and how by that point the show looked long in the tooth before the host change. Edit: The 1975 for Bill's 4th show should indeed be 1976 as in the original lineup, must've edited an old version. All episodes will auto-publish at their scheduled times and will remain up until December 6th. That Bullseye theme clip made me think that particular portion of the theme had finally surfaced. The clean versions I’ve heard always jump cut to the end, right as that verse plays. I forgot how much I loved the Bullseye theme. I kinda pushed it out of my brain once I realized how much of it was lifted from Santa Esmeralda, but it is still a lovely piece.